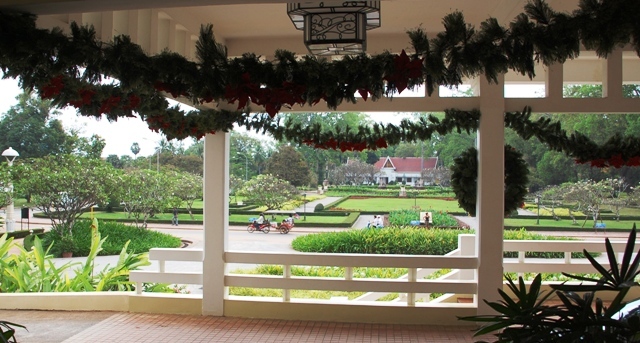 Mom and Dad had gone and we were onto the next phase of our holidays...Christmas in Cambodia. Hhhhmmm...does not have quite the same ring to it as "Springtime in Paris" but we sure liked the sound of it. Erin left two days ahead of Chris in order to visit Uncle Bob in Hong Kong. Unfortunately, his health has taken a turn for the worse and Erin cannot imagine being so close without making a visit (Dec 19). It was wonderful to see his sparkling blue eyes...yes, even at 94 years old, he is still charming. Quite a special visit. 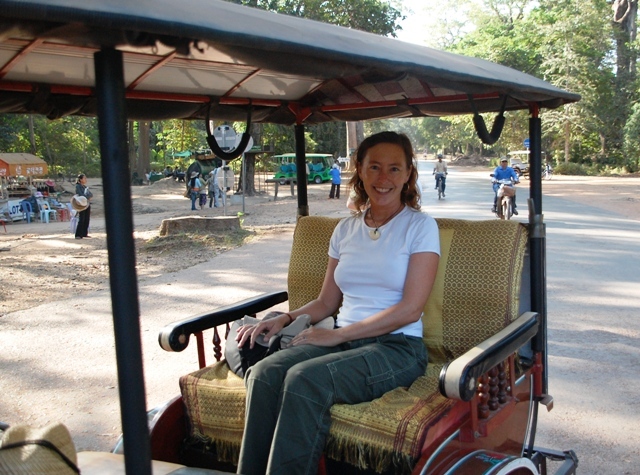 Erin arrived into the small airport of Siem Reap, Cambodia, on Dec 21. Chris met me at the airport and it was immediately clear that this was an enchanted place. Wood cooking fires scented the night air where bicycles and tuk tuks shared the narrow roads with a few cars...only small lights lit the road. Cows rang their neck bells as they sauntered...grazing along the side of the road. Angkor Wat looked majestic as it was illuminated beneath the star filled night sky. Wow, quite a first impression! After being spellbound by Angkor Wat we headed back to Pavillon Indochine (www.pavillon-indochine.com) for dinner...and caught up on each others busy activities over the past couple of days. 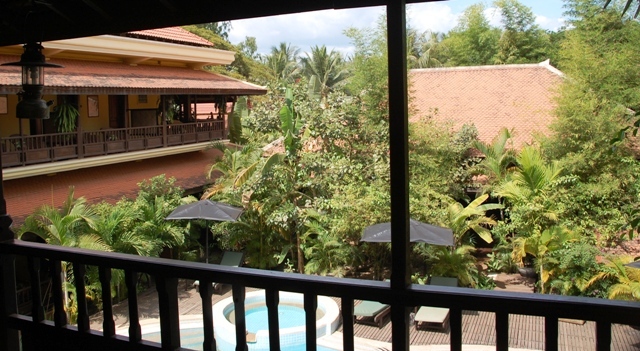 This charming guesthouse has an open sided restaurant where street sounds are heard beyond the walls and regional artifacts leave you in no doubt that you are anywhere other than colonial Cambodia. 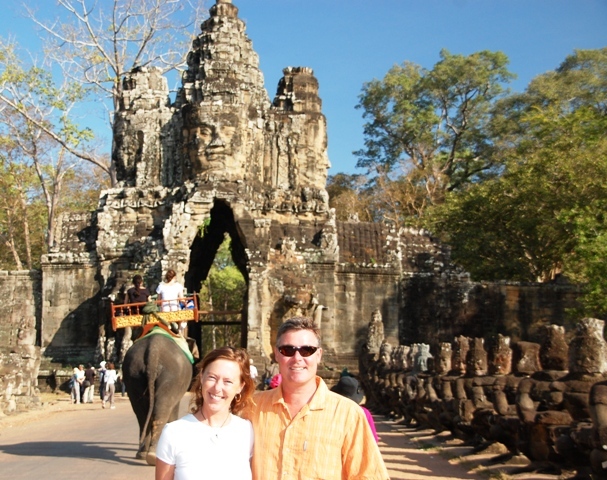 We have both dreamed of visiting the temples of Angkor for years...and continue to pinch ourselves that we are really here. 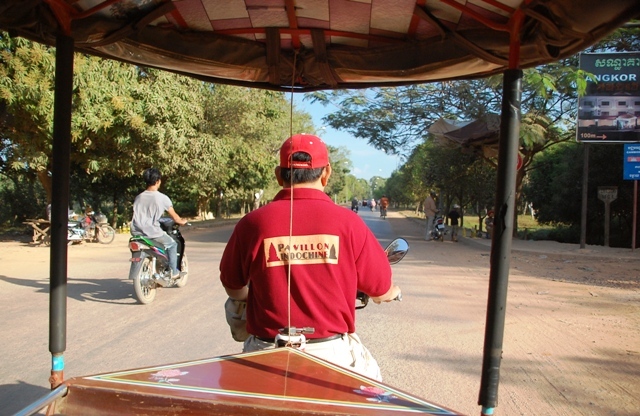 The footprint of Angkor is approximately the size of Manhattan...so we hired a remorque-moto (motorbike with a hooded carriage towed behind...much like the tuk tuks in Thailand) to move from temple to gate to terrace throughout the monuments...and at just $12 per day it is a great deal. Oh, and do not worry about getting Khmer currency...everyone uses the US dollar...ATMs even provide it when withdrawals are taken...making currency conversion a thing of the past. Chhe, our tuk tuk driver for the next two days, took us to all the right spots at the right time of day. 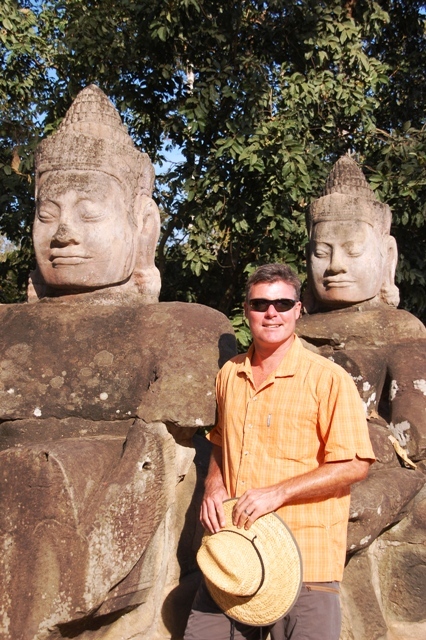 Our guesthouse was "on the road to Angkor" and made for a quick drive to the monuments. 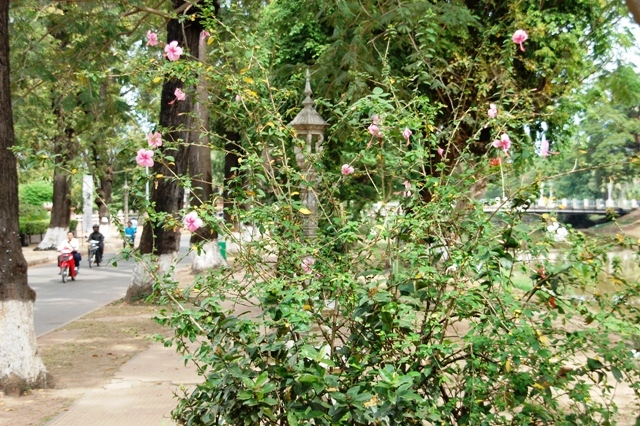 The drive on the approach roads to the monuments are tree lined which obscure views until you literally burst upon them. 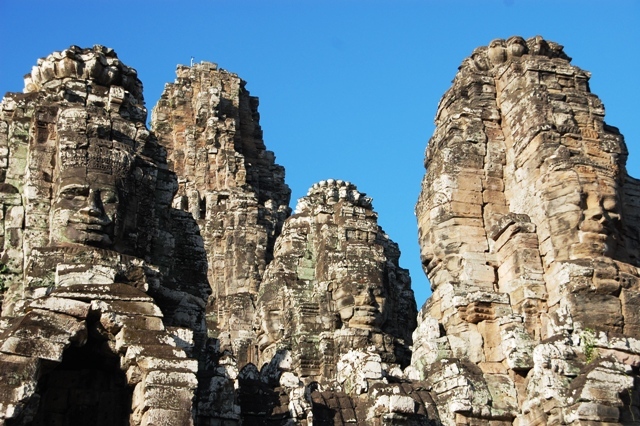 The temples were built during the classical period of Cambodia when the Khmer empire was one of the great powers of Southeast Asia...a 600 year span from AD 802 - 1432. Many details are known of this period but mysteries remain...creating a woven backdrop of fact and myth to every carving and architectural marvel. At the time of construction they were thriving cities...with possibly as many as one million inhabitants at their height (at this time the population of London numbered a mere 50,000). 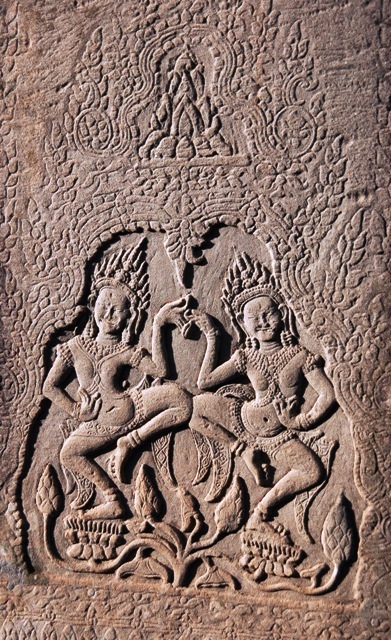 However, this rich heritage became tumultuous and, eventually, brutal...only finally emerging in 1993 from 50 years of Civil War and the horrors that were Pol Pot and the Khmer Rouge. 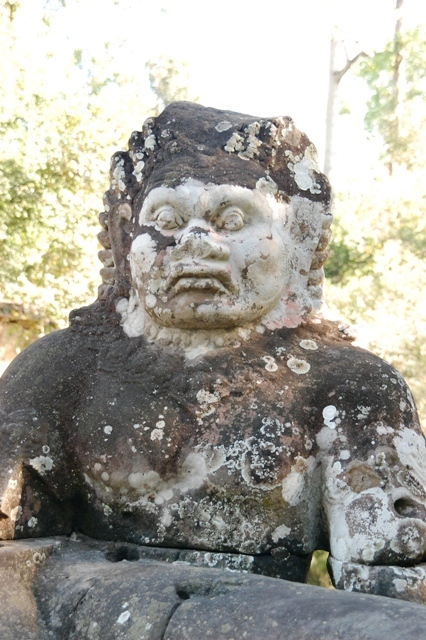 Unfortunately, external powers were also to blame for much of the nation's hardships...imperialistic France ruled Cambodia, Laos and Vietnam for 85 years (beginning in the 1860s) under the colonial banner of French Indochina...and American bombing raids during the Vietnam war took a huge toll on the nation as well. 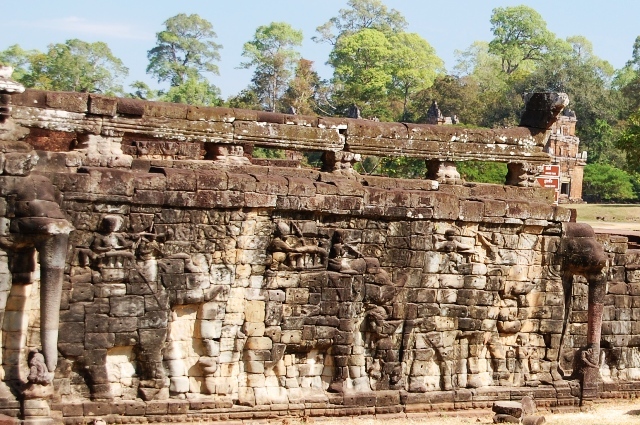 Today, the temples are a source of great pride and cultural identification for the Cambodian people...with ever-present, on-going restoration around every corner. We marveled at these structures...only "re-discovered" in 1914 by the French...carefully hidden by the remote, dense jungle for centuries. 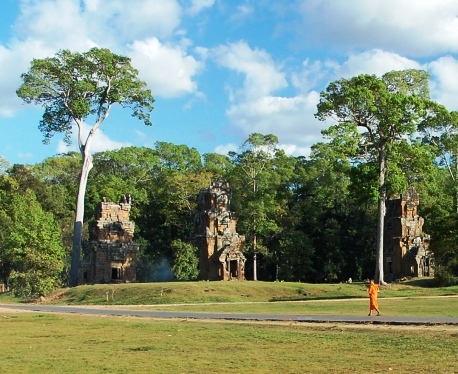 We entered Angkor Thom through the magnificent South Gate...more than 60 feet high decorated with elephants and gargantuan faces...we were hooked. 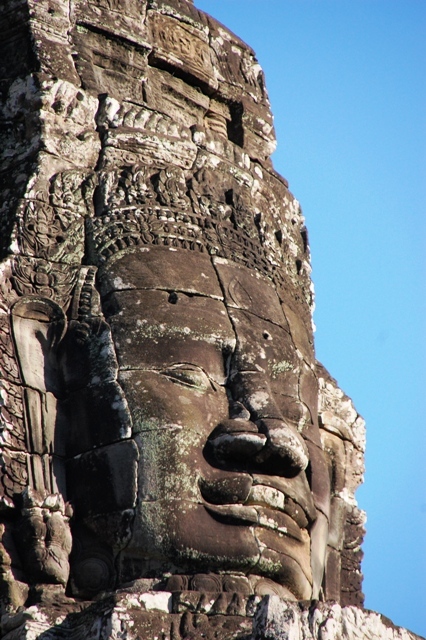 Just past the South Gate is The Bayon. 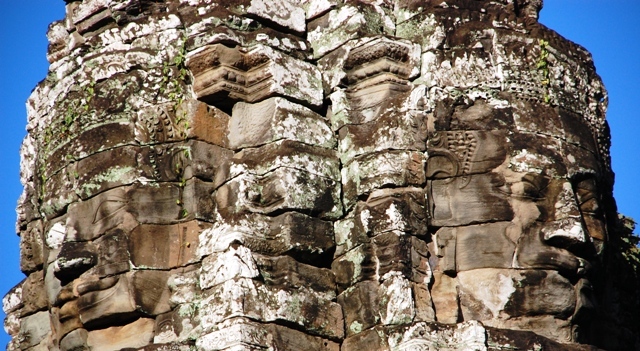 The most unusual characteristic of this mysterious structure are the 216 enormous smiling faces (exact function and symbolism is still unknown). The faces seem to have all the answers but are not yet ready to tell...preferring to smirk as they gaze in all directions. This was a real favorite for us and we returned a few times to see the faces in different light throughout the day. 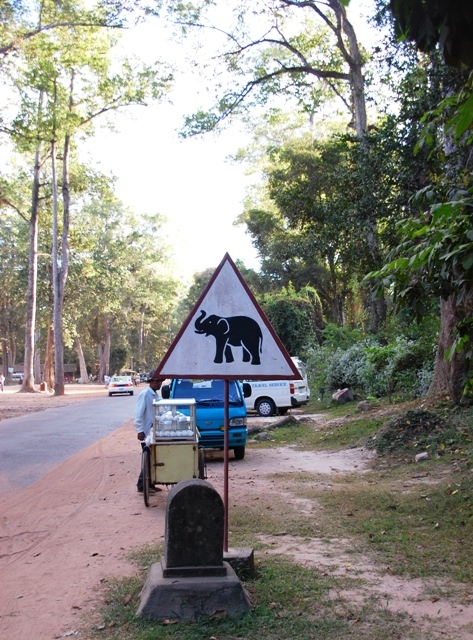 Proceeding North from the Bayon we stopped at the Terrace of Elephants at the center of Angkor Thom. This "reviewing stand" is longer than the length of three football fields (1000+ feet). It was used as the base for the king's grand audience hall...pomp and grandeur provided by royal guests, pennant flags, cavalry, horse-drawn chariots and elephants. Just beyond the Terrace of Elephants lies the Terrace of the Leper King. Below the platform stands a hidden terrace that was covered up when the outer structure was built. This now shaded spot below ground level is a terrace within a terrace. 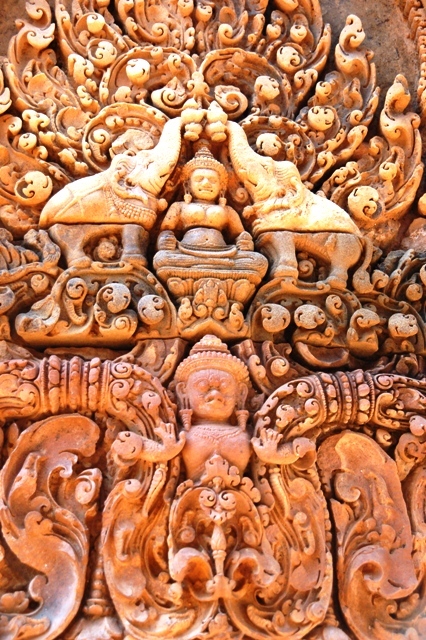 Four tiers of carvings look as if they were carved yesterday due to their time spent covered up. 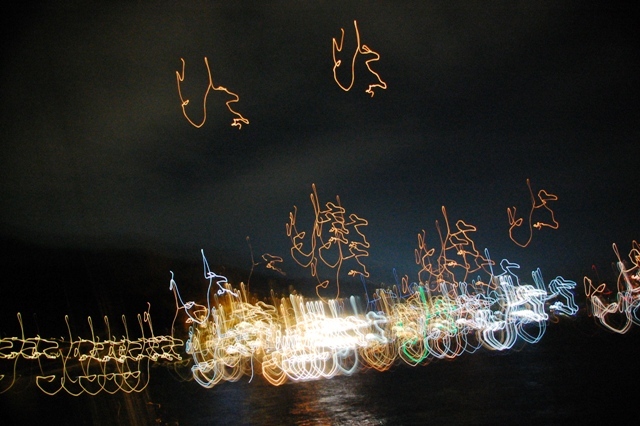 Expressions are clear and delineated. 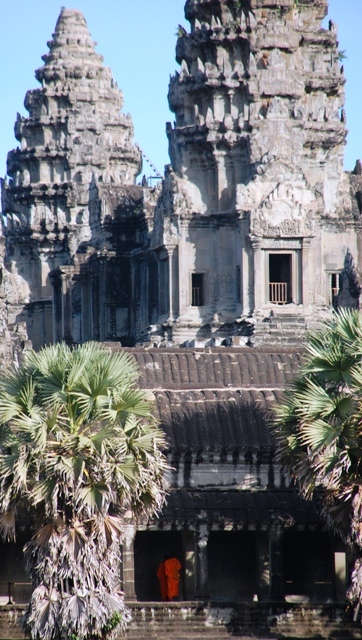 We wonder how this place can possibly become any more amazing...but Angkor Wat was stunning in the afternoon light. 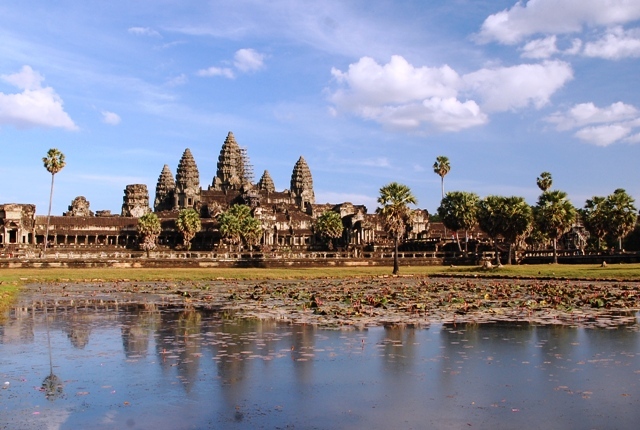 Angkor Wat is the world's largest sacred building. 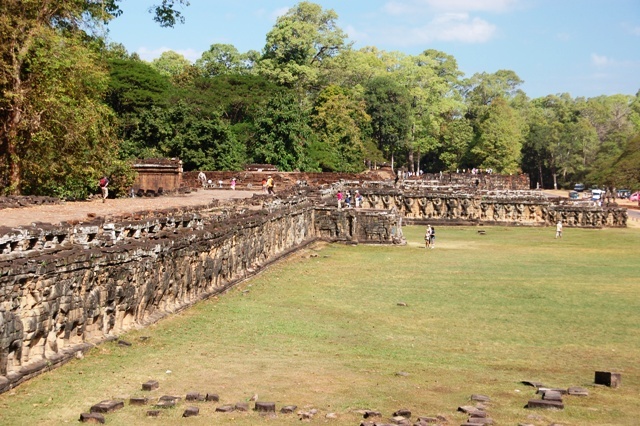 Its moat is as wide as two football fields with an outer wall that is two miles long. 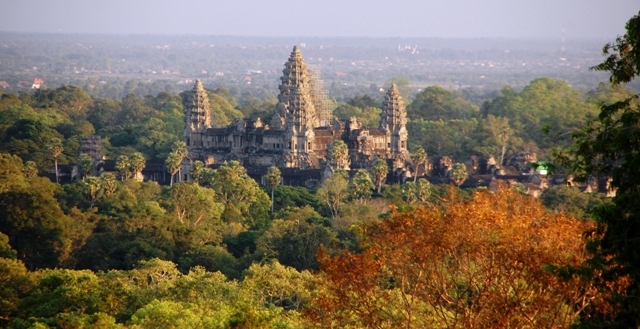 Angkor Wat's center shrine is larger than Paris' Notre Dame Cathedral and soars more than 660 feet above the surrounding flat landscape. 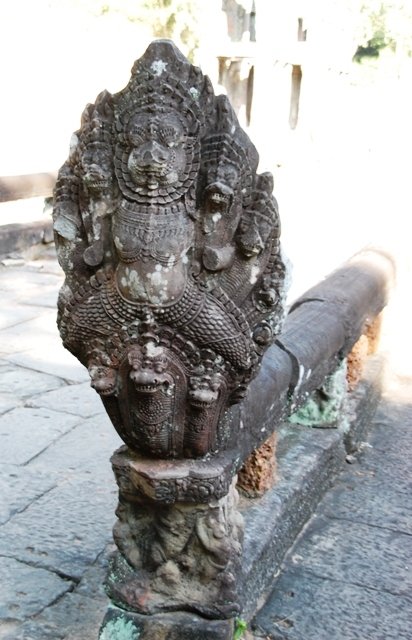 Believed by most to be primarily a tomb...orientated towards the West (symbolically the direction of death)...however, elements common in temples also exist...fueling a lively debate. 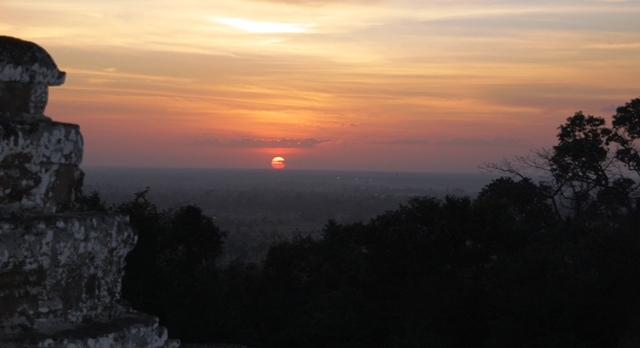 We spent three hours here before heading for the hilltop temple of Phnom Bakheng...the definitive sunset spot. 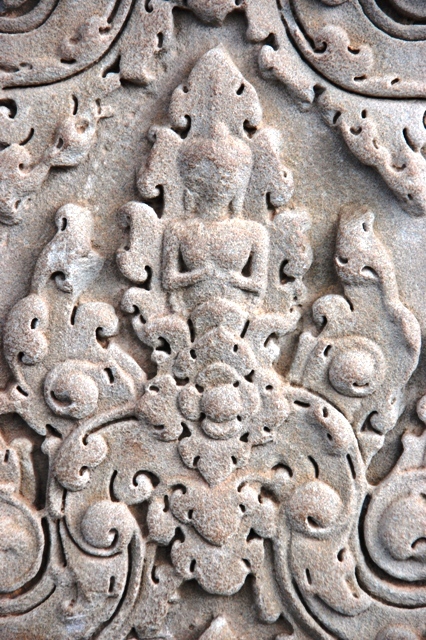 At Angkor Wat we climbed stairs, viewed countless detailed carvings of Apsara (heavenly, dancing nymphs) and watched real time restoration in action. 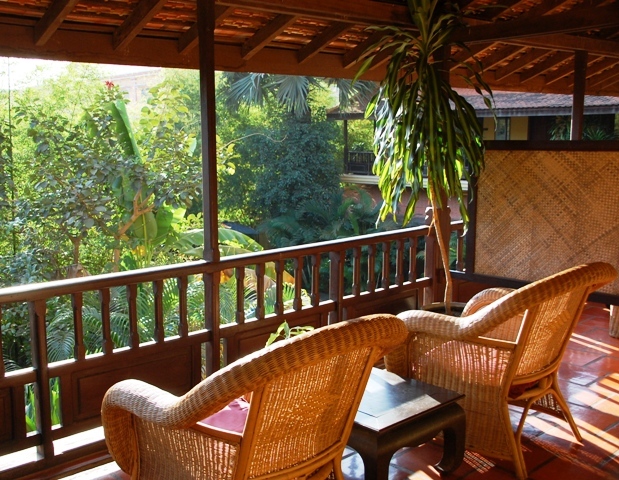 Our brains were spinning as we returned to Pavillon Indochine for dinner. Trying to grasp the weighty symmetry and symbolism of the day the mood was lightened by the hop-hop-hop of a small frog through the dining room. Holy mackerel...what a magical place this is. 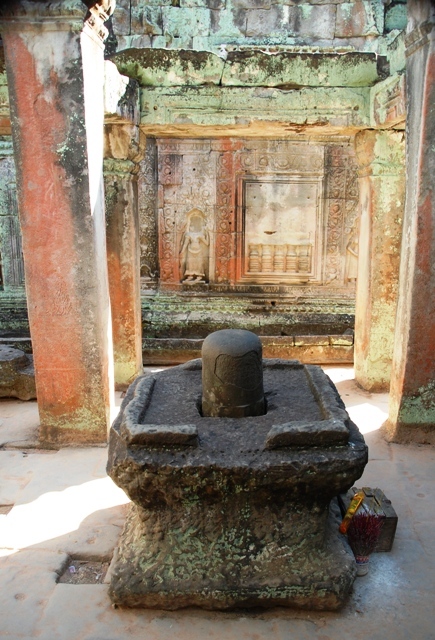 Siem Reap has become a driving force to revitalize Khmer cultural skills after the harsh period of Pol Pot and the Khmer Rouge...when all forms of personal, religious and artistic expression were systematically removed from society. 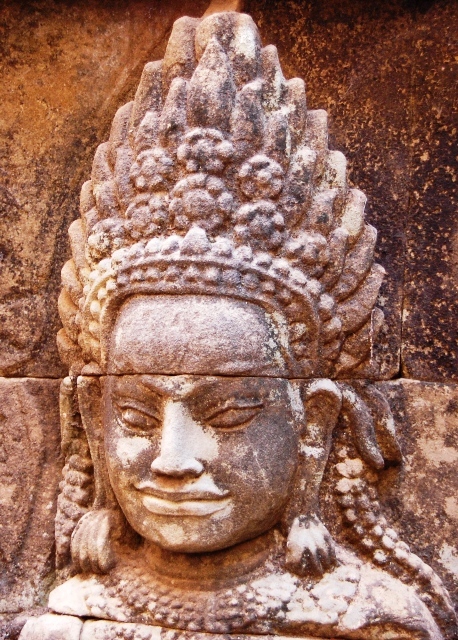 The vehemence with which the Khmer Rouge pursued its enemies was implemented with instant death if any language other than Khmer was spoken, killing of any artists discovered and destruction of written records related to Angkor. 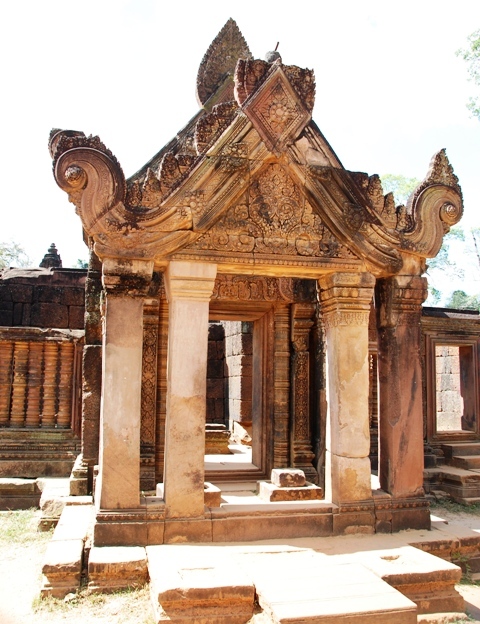 Restoration experts originally numbered more than 500 before Pol Pot; unfortunately, after his reign of terror was complete only TWO remained. 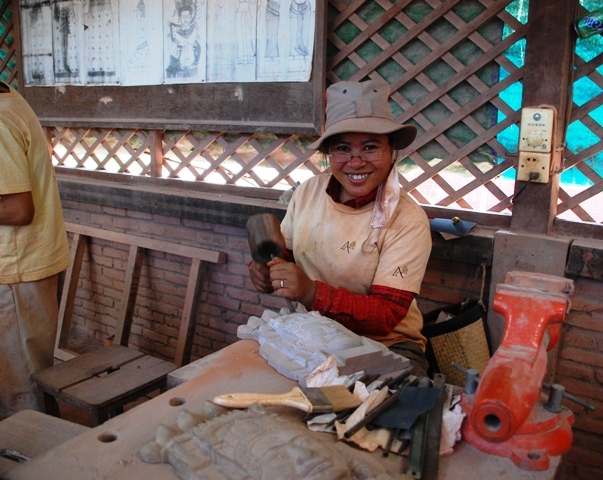 Temple restoration is always a slow process...dismantling, cleaning and re-assembling in order to save. 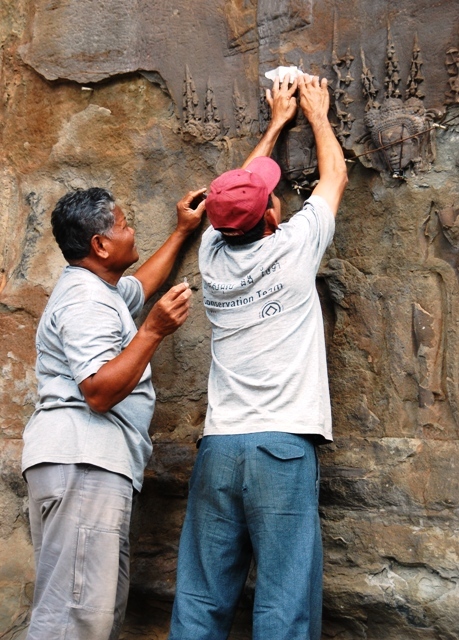 One such project was in process with all stones laid out for cleaning when the Khmer Rouge stopped the activity and destroyed all records about how to put the temple back together again. Wow - what frustration there must have been?! Later, a painstaking two year endeavor resulted in successfully putting the jigsaw puzzle back together. 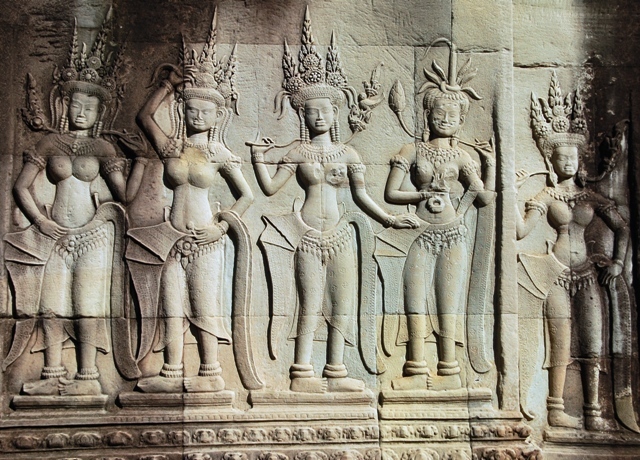 Fortunately, Cambodian cultural heritage is again thriving. 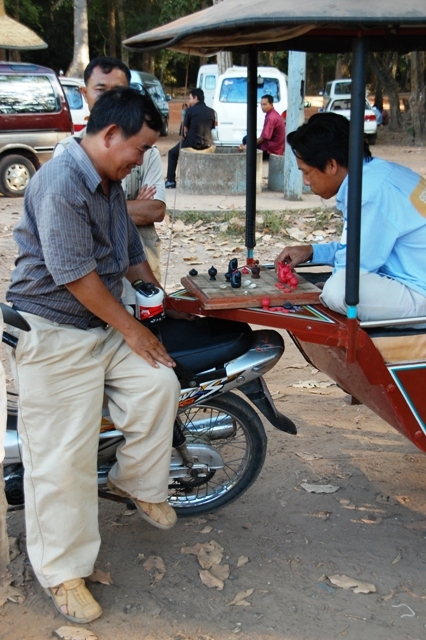 Dec 23 started with a stop at Artisans d'Angkor (www.artisansdangkor.com). 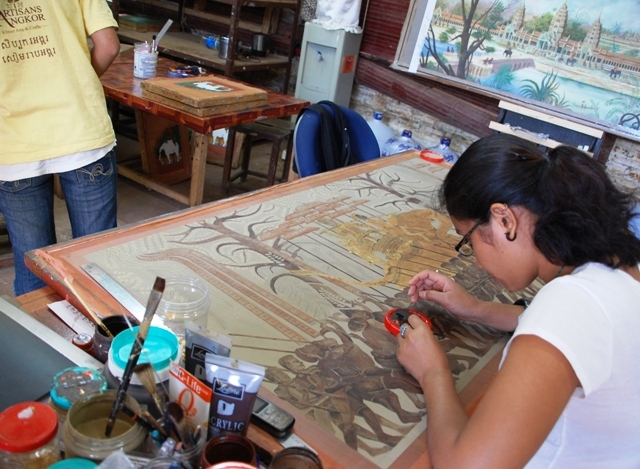 This shop sells beautiful stone and wood reproductions created by young people from impoverished backgrounds apprenticing through highly-skilled training programs in stone carving, wood carving, polychromy-lacquering-gilding and silk weaving. But then it was back to the monuments. We reviewed the list of ruins not yet visited and came up with a plan of attack. 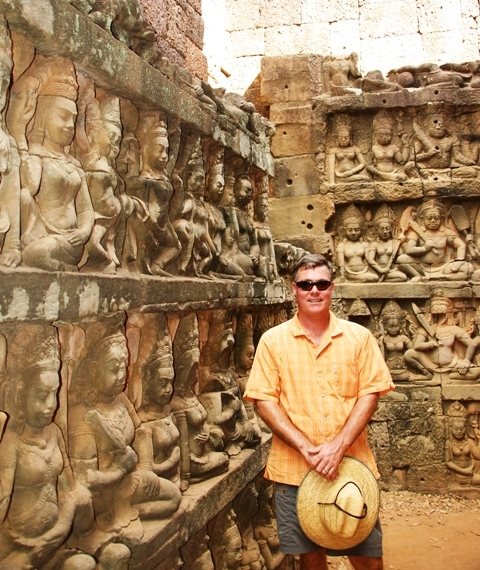 First stop was Ta Prohm which consists of two immense sanctuaries. 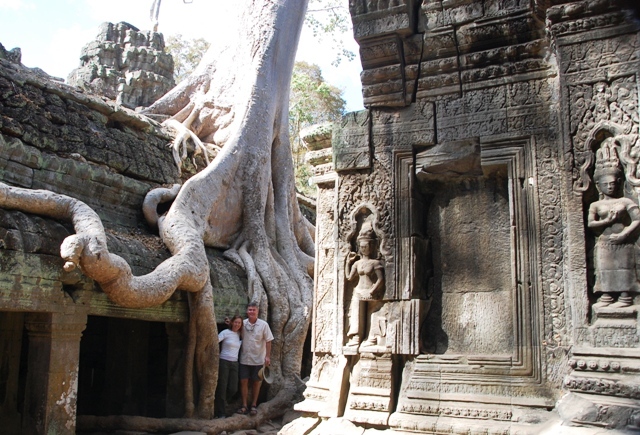 Restoration at Ta Prohm has allowed the jungle to reclaim the monument so that visitors of today can have a glimpse of what early European explorers might have seen when they first arrived. The effect is other worldly...and even caught the eye of Hollywood as the setting for the original "Tomb Raider" movie. 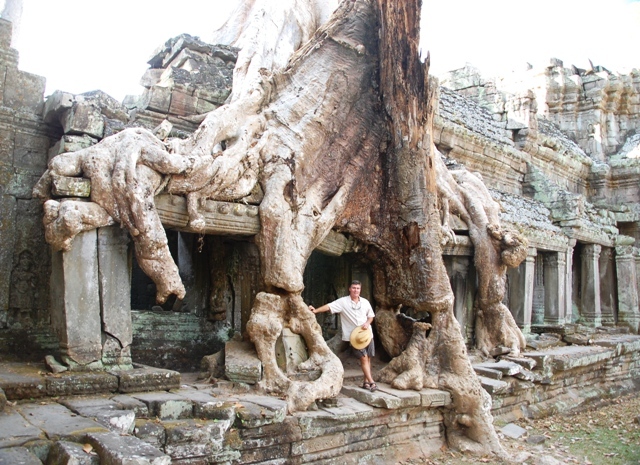 The ten centuries of jungle growth are abundantly clear as massive root systems snake through rooms and stones are quite literally swallowed by the jungle. Preah Khan was next...dedicated to Jayavarman VII's father; whereas, Ta Prohm was dedicated to Jayavarman VII's mother. 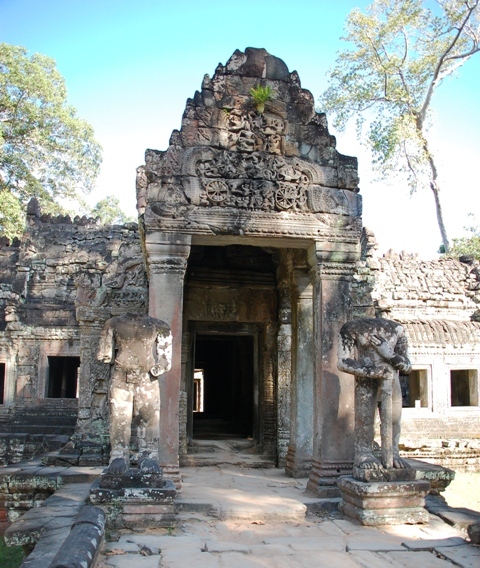 Originally a Buddhist monastery school it was interesting to see the vandalized/removed Buddha images when Cambodia later favored the Hindu religion (today Cambodia is again primarily Buddhist). 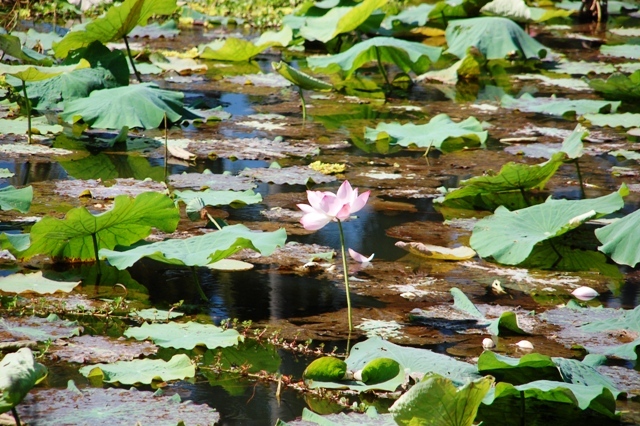 Beng Melea (The Lotus Lake) was a car ride from town (Dec 24). 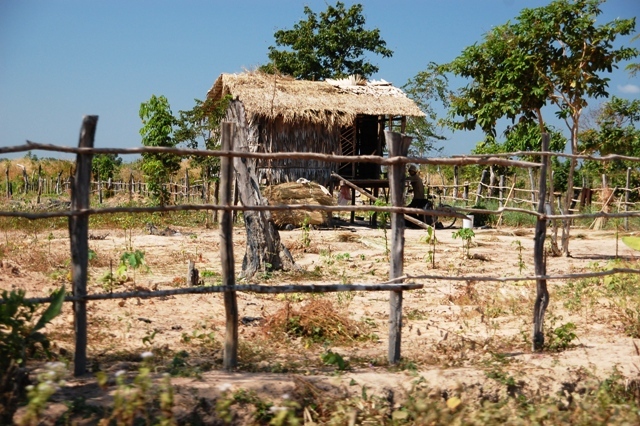 The hour drive allowed us to see the rural countryside of rice fields and working livestock...just recently starting to be replaced by gasoline powered generators. 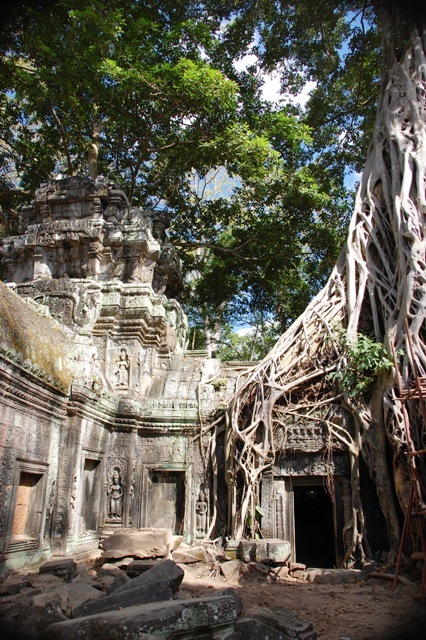 Similar to Ta Prohm, the jungle has been allowed to remain at Beng Melea which quickly brings Indiana Jones to mind. Tumbled building blocks and tree roots mix together as groundskeepers trim only the newest vegetation. The remote location of this ruin means it is required to stay on marked paths...land mines are, sadly, still an issue for this beleaguered nation. 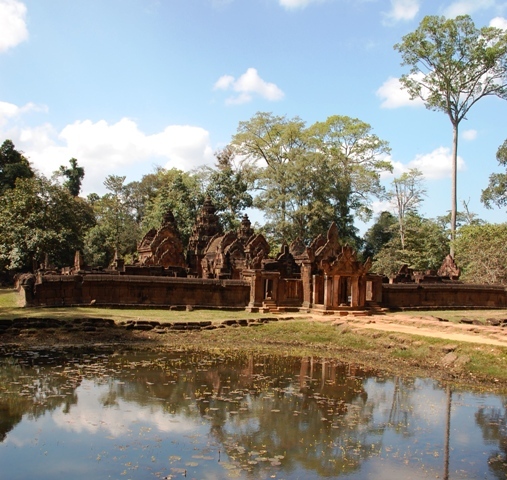 The return drive gave us a chance to stop at Banteay Srei...believed to have "some of the finest stone carving seen anywhere on the planet." 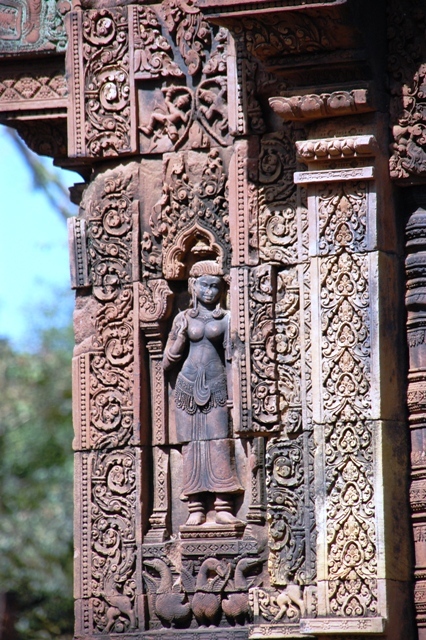 Banteay Srei is carved of pink sandstone (harder than most of Angkor's grey sandstone) which might account for the added delicacy of its carvings...and being small in size it brings to mind a precious jewelry box. 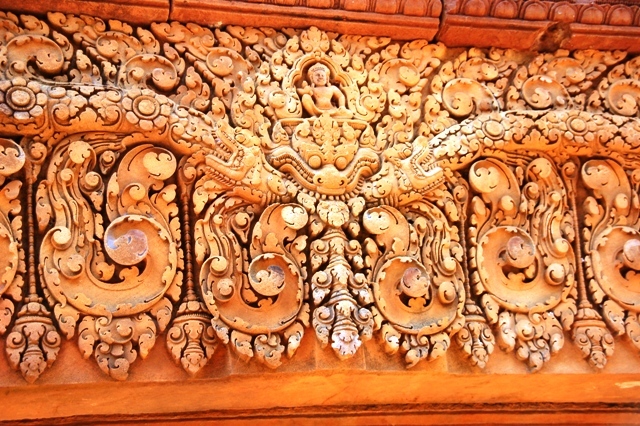 Nearly every square inch of Baneay Srei is delicately carved. So many images are hard to take in and a rest in the shade helps us to allow the craftsmanship to sink in. 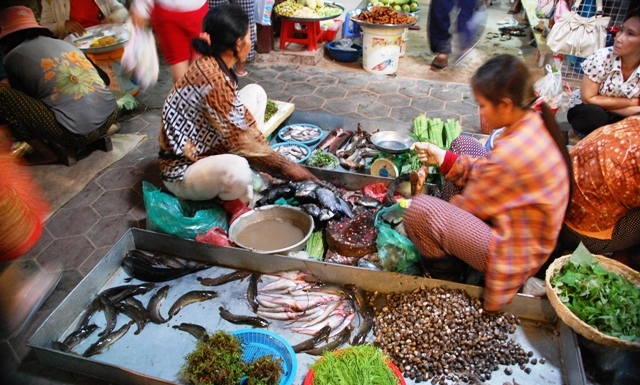 Dec 25 Erin checked out the Old Market in Siem Reap while Chris read back at Pavillon Indochine. 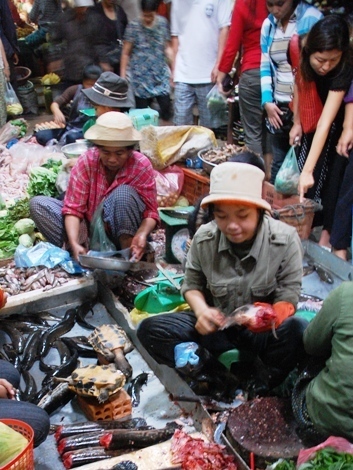 The market was a bit of a shock with rigamortised chicken legs thrust into the narrow passageways, still flopping fish writing on the floor and...gulp...turtles for sale. Eeek! Needless to say, the t-shirt stalls were a bit easier on the senses. 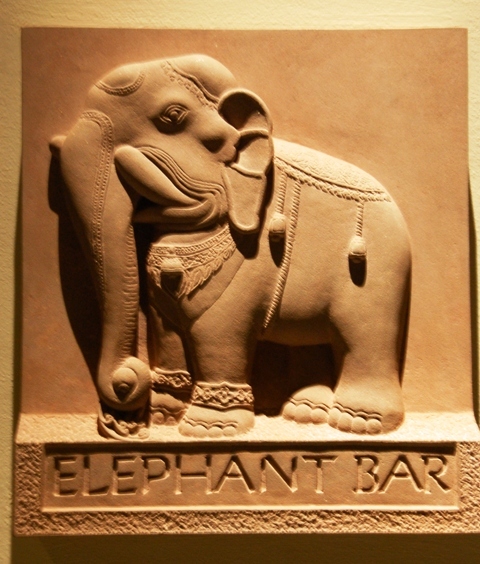 Christmas night was a fun time of billiards and backgammon in the Elephant Bar of the Hotel d'Angkor (www.raffles.com). This historic hotel maintains an air of opulence and luxury that was surely evident in the 1930's when Charlie Chaplin was among the guests. We finished our night with a tuk tuk drive through the Old Market and out to Angkor for one more glimpse of the illuminated ruins...magic. The Bangkok airport was back up and running as we shuttled through...happily reducing our layover from ten hours to two by finding space on an earlier flight (Dec 26). 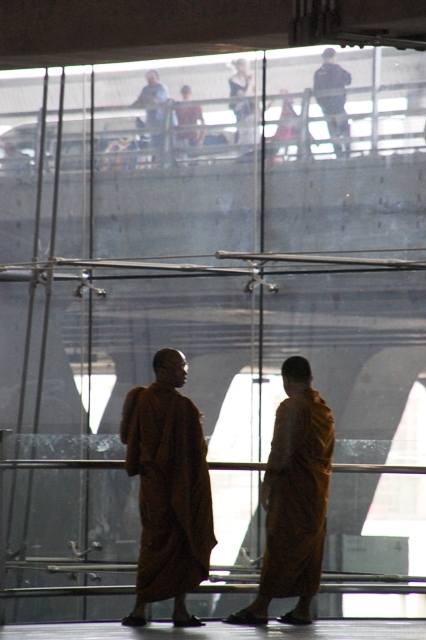 Ah well, we will have to visit bustling Bangkok another time. 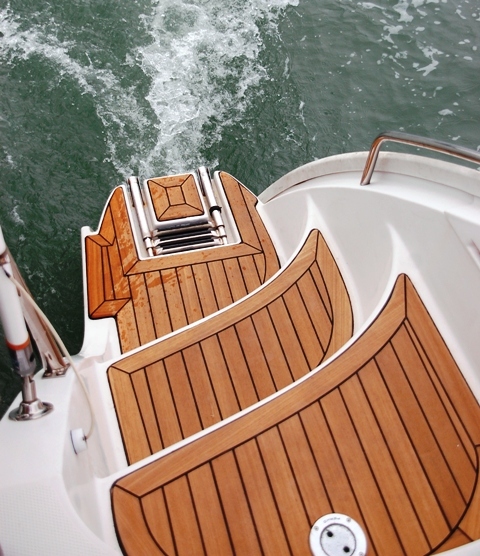 Back aboard Barefeet and we did our final marina projects...and wow...the teak steps were, in fact, completed while we were gone! They look beautiful...and no more water squirts when we step on them. Just one solid provisioning run and a visit from an electrician to (finally) fix the chronic starter motor problem and we were on our way out of the marina for the last time (Dec 30). We headed South around the island of Phuket to the bay of Nai Harn...between Ao Chalong and Kata beach. Hey, there is Xanadu...looks like we will spend New Year's Eve together after all...great news. New Year's Eve was a Norwegian feast of stick meat, potatoes, mashed turnip (not sure about the English word but that is close) and steaming juice for gravy. Oh yeah, and some ice cold Aquavit to wash it all down. The meat is a delicacy usually eaten only on Christmas but Tove and Finn's family brought so much that there was enough for a second celebration and we got to have some, too. "Stick meat" is lamb ribs that have been smoked and salted. Preparation is a lengthy process that begins one day ahead...soak in water for 20 hours...then steam for three hours. The result is tender lamb with an amazing smoky and salty flavor...really delicious. We passed the time between dinner and midnight with a game of Name That Tune hosted by Chris. 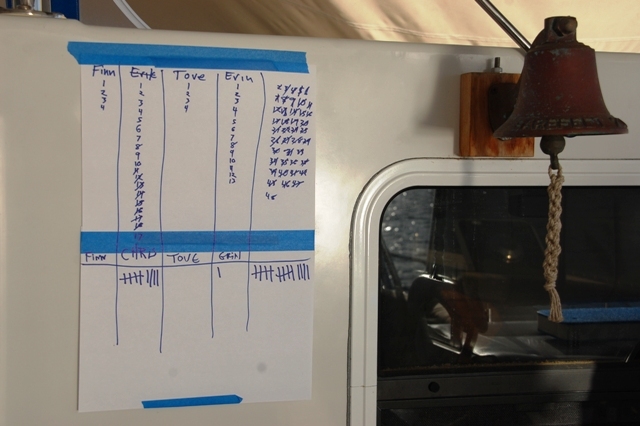 Erik (s/v Vagabond Virgin) was the big winner and the game finished just before midnight when we moved to the foredeck for a spectacular fireworks display and beach launch of countless Thai lanterns...gorgeous! Great celebration all around. We are happily cruisers again...laying at anchor and swimming off of Barefeet. Daily attire is not much more than bathing suits and evenings are welcomed with sundowners. It was two days before we even lowered the dinghy. But a couple of errands still remained. Off we went Jan 2 for dental cleanings and check-ups. Finn gave us a drop-off at the beach and we hired a taxi into town. Erin did not need any additional work; however, Chris needed a root canal. Yikes! Definitely not a fun way to start the year. Ah well, better to know now than...say...Yemen?! The process took a bit longer than anticipated due to a miscommunication that led to a single crown being placed...oops...later the crown was removed, root canal performed and the permanent crown followed in two days. Poor Chris. Soft food and sundowners helped keep everything on-track but his attitude was always upbeat. 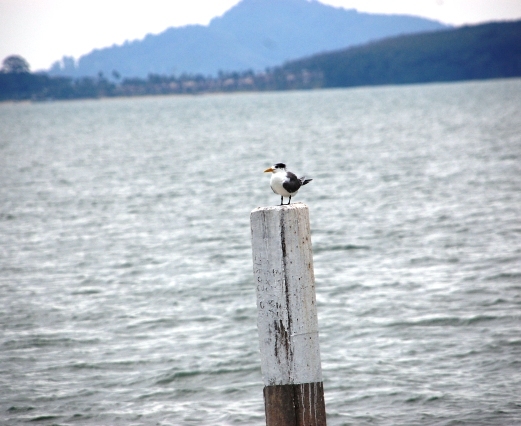 Jan 4 we moved North a few bays to Patong. This is the BIG city! Jet skis buzzing, long-tails chug-chugging and a few cruisers scattered around. There is a wonderful pontoon for dry dinghy arrivals and departures to shore...much easier than beach landings in the surf. We will do our last bit of getting ready from here. Parker arrives in a couple of days which will give us a nice week of R&R before leaving for the Maldives (1500 miles). Our updates might be a bit sporadic going forward but we will update when we can (the satellite map will continue to be updated as we move along). 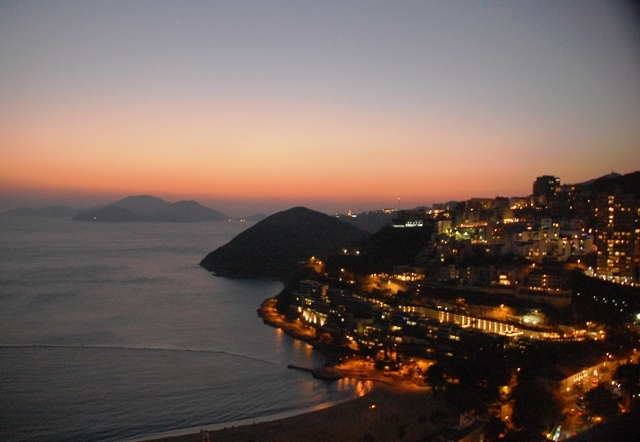 Our plans for 2009 are Phuket...Maldives...Aden, Yemen...Red Sea...Egypt...Mediterranean Greece and Turkey (May-ish).